I was at a meeting the other day and my friend Isabel brought along some pears poached in rose water. They were divine. I was hoping she would post the recipe so I could share it here and to my delight I’ve just discovered that she has (you will find it here). Whilst eating more than my fair share I thought that they would go really nicely with some pistachio crumbled on top as I think pistachio and rose are a match made in heaven. I was still thinking about them on my way home and decided to try this combination in a new bliss ball. My Vanishing Bliss Balls are always a hit but they are quite chocolately so it’s nice to have another option because not everyone likes chocolate (no, really, it’s true). 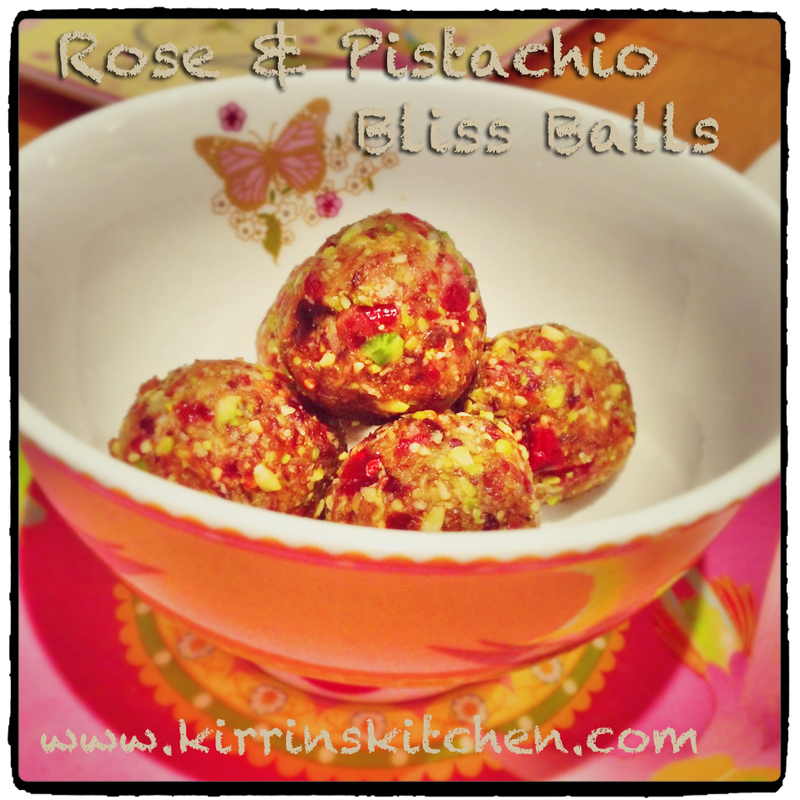 So here they are, my poached pear inspired Pistachio & Rose Bliss Balls. Makes about 24 depending on how generous you roll them. Place pistachios in bowl, turbo 1/2 – 1 sec to roughly chop. Add all remaining ingredients, whizz 15 sec, sp 10. Roll into cherry sized balls. The mix will appear a little crumbly but once you squash and roll it will come together very easily. You could roll them in coconut but I think they are so pretty with the pistachio green and cranberry red that it would be a shame to hide them. These will keep in the fridge for several weeks, and the flavours blend together even more after a day or two. *Rose Essence: Rose essences and rose waters vary in strength significantly. I usually prefer to use traditional rose water in cooking, however my current bottle is too dilute for the bliss balls. To get a good flavour I would have had to add much more and risk making the bliss balls too wet. Even the unrolled mix is pretty! 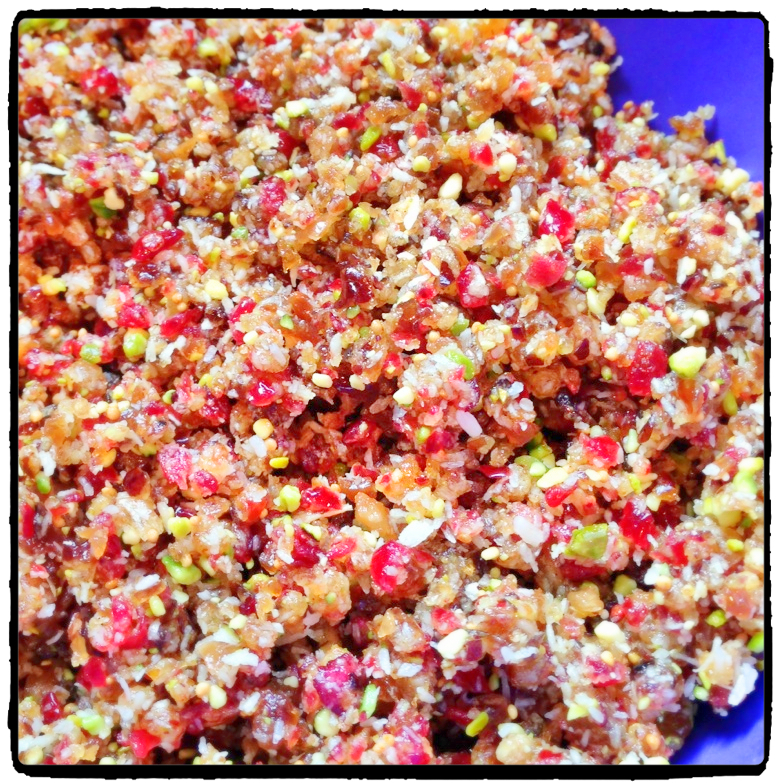 This entry was posted in Recipes, Treats & Snacks and tagged bliss balls, coconut, dairy free, gluten free, grain free, pistachio, recipe, rose. Bookmark the permalink.